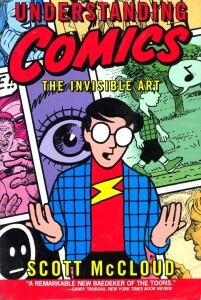 In his brilliant work Understanding Comics – The Invisible Art, Scott McCloud suggests there are six layers to an art work. These are, from the outside in: 6/ surface, 5/ craft, 4/ structure, 3/ idiom, 2/ form, 1/ idea/purpose (p 176-180). He goes on to write (or should that be draw) that the biggest question of all facing an artist is, “Does this artist want to say something about life through his art or does he want to say something about art itself.” (p. 180) McCloud states that when a creator places more importance of Form over idea, “His art would just become his purpose and the ideas would arrive in time to give it substance.” He suggests that creators who follow this path are pioneers and revolutionaries who question the fundamental laws that govern their chosen art. Artists like, Moebius, Stravinsky, Picasso, Virginia Woolf, Michael Haneke or Orson Welles. Contrariwise, if the creator chooses the primacy of purpose over form, McCloud writes that then art becomes a tool of a great storyteller, and the artist devotes all his or her energies to controlling the medium and refining its ability to convey messages effectively. This is the path of creators like Herge, Capra, Dickens, Woody Guthrie and Edward G Morrow who seek to make their art invisible. McCloud goes on to reiterate that this choice is neither permanent, nor exclusive – but that it is a key distinction in great art. So what relevance does this discussion have to micro-budget filmmaking and aesthetics? The budgetary restrictions of digital micro-budget filmmaking mean that the filmmaker will necessarily have great difficulty choosing Quintilian’s path approaching artistic perfection by concealing art (or in McCloud’s terms, prioritising idea and purpose over form). Even in the most contained narrative setting, the micro budget filmmaker will come up against constrains in the use of locations, lighting, production design, grip equipment – and most of all shooting time. There is therefore no way micro-budget filmmakers can or should hope to compete with big budget movies in terms of continuity and production values. Instead they should concentrate on form over idea and become true pioneers of a new type of filmmaking, rather than simply making micro-budget films because they don’t have a bigger budget and then trying to use the resultant film as a calling card to use to find bigger budget producers. If you want to make a calling card to get a job on a big show then you’d probably be better placed using all your money to make a very slick, high budget short rather than a feature on a shoestring. Digital production and distribution offers an exciting new start for a more popular and democratic type of filmmaking, and eventually we hope film consumption. However, we need to make sure that the films we produce turn the limitations of the budget, kit and time to create a new micro-budget aesthetic rather than trying to ape the continuity system of Hollywood or big-budget TV drama. In making TimeLock we knew from the beginning that we would be using a DSLR camera to record the footage. Noir is one of the most subjective and artistically innovative genres and from the start David Griffith set out to develop a highly subjective camera system that would allow him to work in the first and second person, rather in the traditional third and first person. Here the camera and narrative voice would always appear to the audience be in the body space (or the mind’s eye) of one of the main characters (either Mark, Cal, his colleague) to enhance both the sense of claustrophobia, the maze-like dimensions and layout of our fictitious hotel, and the moral and psychological relativisations at the heart of the story. To accomplish this, David storyboarded the step outline before revising it in line with the imagery, and only then writing the full screenplay. One of the main reasons for inviting DOP Simon Hipkins to join the project was because he was a stills photographer as well as a cinematographer with an instinctual feeling for composition and camera movement using a DSLR as opposed to a larger, more traditionally proportioned camera and lens. The compactness of the DSLR also meant that we could get incredibly close to the actors without intimidating or inhibiting their thoroughly rehearsed performances. On set we were ruthlessly strict with ourselves in terms of coverage; about whose perspective and whose POV it was at any given moment. It was not uncommon for us to shoot scenes in two or three ten-minute takes. This not only ensured we achieve our target shooting-rate of eight and a half pages of screenplay per day but also produced great results in terms of performance and flow, adding greatly to the credibility of a highly stylised film with an accentuated approach to reality. These audio-visual aesthetics are complemented perfectly by a highly characterised score from Howie Reeve, RM Hubbert and Rafe Fitzpatrick and a cleverly modulated and highly subjective soundscape courtesy of the brilliant young sound-designer Dave McAulay, who set out to express the sweetly unpleasant smell of moral decay through sound. The result is a film with uncompromising audio-visual aesthetics which is like few other films you have ever seen. Scott McLeod (1999). 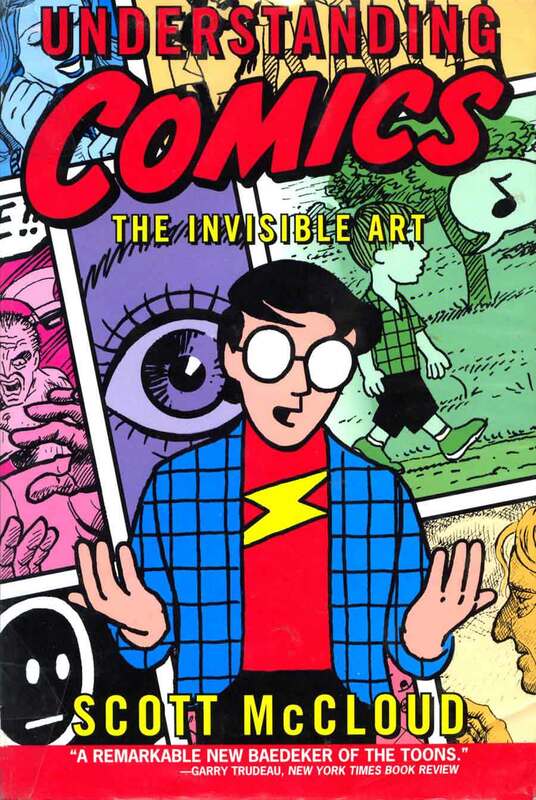 Understanding Comics, The Invisible Art. London: Harper. Anyone who saw Glasgow’s Tattie Toes play live will surely be familiar with genial shorts-wearing bassist and bell-ringer Howie Reeve. To an already extremely inventive band comprising wildly disparate stylistic elements, he brought a (post) punky sensibility, a lean, wiry bass tone and plenty of genial humour. Alas, Tattie Toes are no more. The other members can be found playing with The One Ensemble, Alasdair Roberts, Hanna Tuulikki and others, but Reeve has decided to go it alone. Switching his gnarly electric four-string for the subtleties of acoustic bass, he delivers 12 intricate and expressive solo compositions. Reeve describes this as the most personal music he’s ever made, and you can certainly hear why: a sense of warm intimacy pervades the whole thing. Recorded live and (mostly) unaccompanied in his living room, Friendly Demons is very much a home-made concoction, and that’s very much its strength. The tracks are alive with ambience, dotted with string-squeak and fretbuzz, and even feature the sound of Reeve breathing as he focuses during the more difficult, tricksy passages, recalling the iconic jazz mumbles of Rahsaan Roland Kirk and Thelonious Monk. 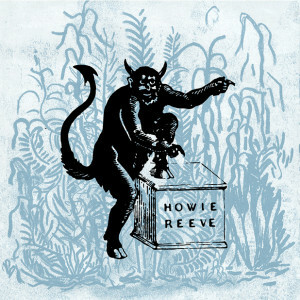 An extremely proficient player, but never gratuitously showy, Reeve’s focus is on tunes and songwriting, even though only a handful of tunes feature his soft, understated vocals. His approach to bass is beautifully expressive, melodic and thoughtful, but also takes in flamenco-style flourishes, charging post-punk grooves, choppy, percussive passages and one surprisingly violent bout of chaos. Named in tribute to his local greengrocer, ‘Stalks and Stems’ features a fantastically wobbly and boisterous attack of string-bent low end, while ‘The Playroom’ unexpectedly blossoms into an avant-folk refrain with honeyed harmonies from Foxface alumnus and the album’s recording engineer, Michael Angus. As inventive and playful as it is richly emotional, Friendly Demons will appeal not only to admirers of RM Hubbert’s delicate acoustic portraits, but also to fans of the complex rambunctiousness of Minutemen and The Meat Puppets. 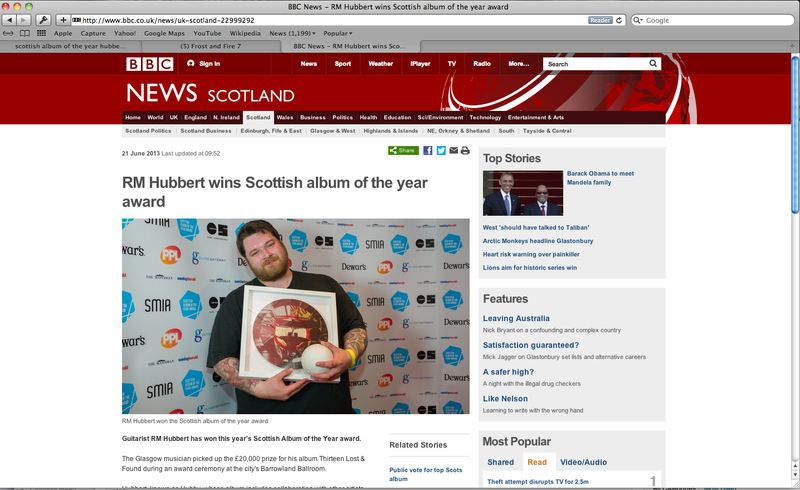 RM Hubbert wins Scottish Album of the year. 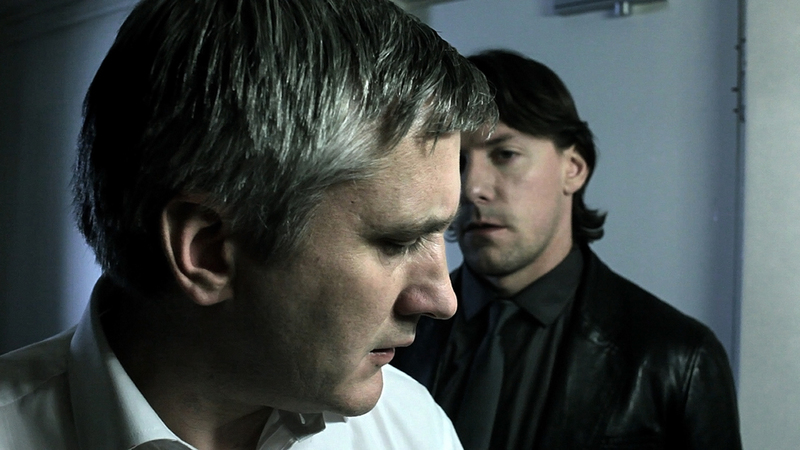 The cast and crew of TimeLock the movie are delighted. Here are some of the many, many to articles about Hubby and his fantastic win at this year’s Scottish Album of the Year (SAY) Awards.